CNN's Matt Hoye is an idiot, mindlessly regurgitating White House talking points. At the end of the APEC trade summit in China, U.S. President Barack Obama announced a climate change agreement with Chinese President Xi Jinping that would cut both countries' greenhouse gas emissions by close to a third over the next two decades. Under the deal, the United States would cut its carbon emissions between 26-28% -- from levels established in 2005 -- by 2025. China would peak its carbon emissions no later than 2030 and would also increase the use of non-fossil fuels to 20% by 2030. 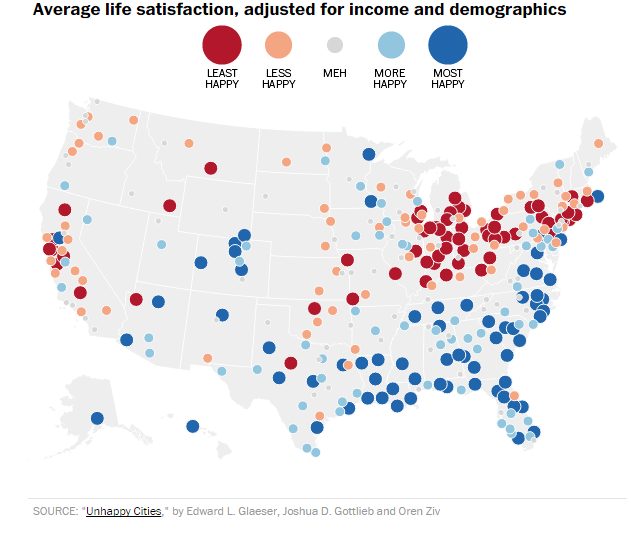 Check out the map of people's life satisfaction by city. There's obviously a huge weather effect, with people being much happier in the sun belt and miserable in the cold northeast, but California manages to create misery even with the country's best weather and beautiful geography! Therefore, it will not happen? A Republican takeover of the U.S. Senate on Election Day would promise increased political turbulence for the Federal Reserve. Financial executives say a GOP-led Senate would ratchet up congressional scrutiny of the central bank's interest- rate policies as well as its regulatory duties as overseer of the nation's largest financial firms. Republicans haven't controlled the Senate since before the 2008 financial crisis and recession, which put a spotlight on the Fed and its powers. "If the Republicans take control of the Senate and thus have control of both the House and the Senate--two words for the Federal Reserve: Watch out," said Camden Fine, president of the Independent Community Bankers of America.